Ruger American 270 rifle, bolt action with 22 inch barrel holds 4 rounds. Marksman Adjustable trigger. Ergonomic lightweight stock. Short 70 bolt throw. Patent-pending Power Bedding. 4-round rotary magazine. Hammer-forged barrel with ultra-precise rifling. Regret selling my first one. Good lightweight rifle. is there a scope rail on this gun? BEST ANSWER: mine came with two piece weaver mounts. 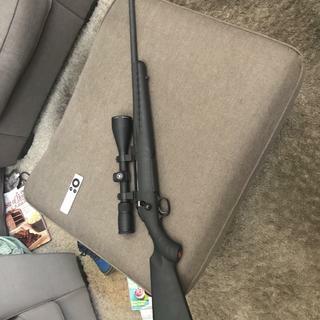 they were too far apart to clear the bells on the scope i used so i had to buy a one piece rail so the rings could be a notch closer. There is a weaver style (not 1913 style) scope bases that comes mounted on the rifle from the factory. All you need is scope rings, and of course a scope. Hoped that helped. Drilled and tapped with four screws...I used a Weaver style base. Yes. It is a two piece rail. Weaver rings will work nicely. No there isn’t a rail on it. It is tapped for one. Great price. Good budget hunting rifle that shoots as well as a expensive gun. Action is a little noisy and stock feels cheap but it is really lightweight. Great shooter out of the box. It shot 3/4"moa @100 with federal fusion 130 grain with a bushnell 6-24×40 scope. Will recomend this rifle to anyone as a starting platform. Great rifle at a great price! For a budget priced rifle this is great. The Ruger American does everything that I need for a hunting gun and it is very affordable. First time customer, now Lifetime customer! Great rifle for the price. Outstanding service from Grabagun. Rifle arrived in less than half the estimated time. Just got this gun and had a Vortex Diamondback 3.5-10x50 scope mounted on it. Hoping to use this for elk hunting in Colorado. Haven’t had a chance to shoot it yet. Just had a Vortex Diamondback 3.5-10x 50 scope mounted. For the money, I don't see how you could ask for a better gun: fast handling and as accurate as any gun I own. I have the American in 270, 308 and 243 and I'm not done buying them! extremely good value for the price. Glad I got it! Service was excellent form GAG! Haven't sighted this one in yet. I have an All American in .223 Rem and have deer hunted with it. I love it! I will be in an elk drawing this year and wanted something bigger for the elk. I really like the Ruger Americans. They are not expensive and they shoot good! Can't go wrong with one of these. The new Ruger American Rifle is the latest engineering innovation from America's leading firearms manufacturer. Offered in short- and long-action calibers, it combines the rugged reliability of Ruger's heritage with their forward-thinking ingenuity.